Sachertorte is a chocolate cake, invented by Franz Sacher in 1832 for Klemens Wenzel von Metternich in Vienna, Austria. It is one of the most famous Viennese culinary specialties. Left: Sachertorte from the Hotel Sacher, Vienna. 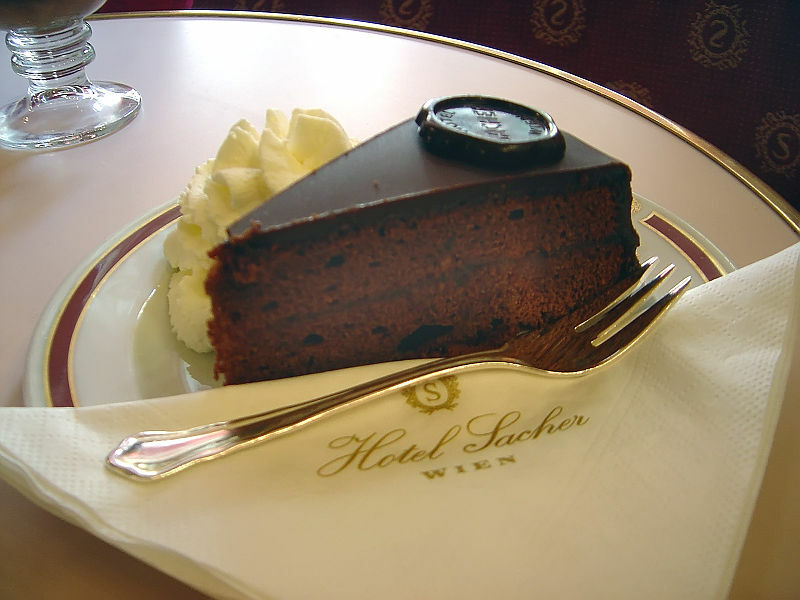 The Original Sachertorte is only made in Vienna and Salzburg, and is shipped from both locations. Sachertorte is made up of chocolate, nuts, apricot, butter, eggs and sugar. The cake consists of two layers of dense, not overly sweet chocolate cake (traditionally a sponge cake) with a thin layer of apricot jam in the middle and dark chocolate icing on the top and sides. It is traditionally served with whipped cream without any sugar in it, as most Viennese consider the Sachertorte too "dry" to be eaten on its own.